Download the new Dinosaur Roar app! If you just love dinosaurs there’s a brand new app to check out called Dinosaur Roar! The app brings to life the book by Paul and Henrietta Stickland, Dinosaur Roar!,which has sold over 5 million copies across the world and is already described as a modern classsic! The app includes an interactive story that’ll take you into the dinosaur’s world as you watch, listen to, and touch the dinosaurs as they stomp, shuffle, snort, chomp, grunt, blink squeak and roar! As you travel across the dinosaur’s world, listen to the story, read it yourself or even record and save your own voice to make up a whole new story! 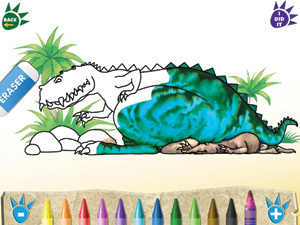 You’ll be able to colour in the dinosaurs, add patterns, and even give them a name. Then watch your dinosaur come to life and move around the screen! Plus, all sales from the Dinosaur Roar! app will support the work of the Natural History Museum. Dinosaur Roar! is available now! Click here to find out more and to download! Dinosaur Roar! by Paul Stickland and Henrietta Stickland is published by the Penguin Random House Group.